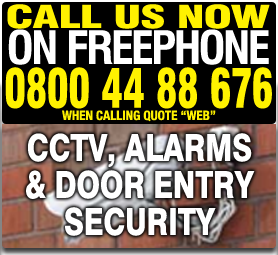 Burglar and fire alarms, CCTV cameras and door entry. We provide state of the art security systems including wireless house alarms, CCTV with remote monitoring and door entry. Get the most effective security systems for your home or business at highly competitive prices. We offer a range of customised Intruder Alarm systems individually designed for your property, the cornerstone of home and business protection. Proven to act as a major deterrent to criminals, you can record any suspicious activity which can be used as evidence should a crime be committed. Monitor your system from anywhere with an internet connection on smartphone, PC, tablet or even web enabled TV! Get priceless peace of mind and a strong technological edge with our CCTV and lighting solutions. YorkshireSatellite Door Entry solutions provide physical security, monitoring and controlled access into your property 24/7. Standalone or in combination with our Automated Gates & Barriers and CCTV systems. We offer options for video and wireless systems which can be run from your television, computer and/or CCTV monitors. Just moved house? Taken on new business premises? Call us to find out how your legacy system might be improved. Existing security systems can be serviced or upgraded. Technology is moving fast! YorkshireSatellite – A Fast Solution to Your Security Problems. Call us now on Freephone 0800 4488676 for more information.